We said in a previous post that VRML is not dead. Surprisingly, it still rocks and is having a re-birth that can be seen in news related to this language that appear. The increasing presence of VRML on Twitter. 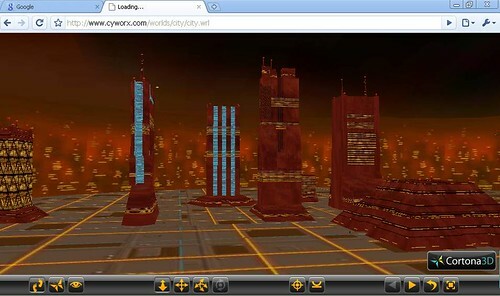 The arrival of ExitReality as a solution for virtual worlds. The proposal for Google's O3D to give some support for X3D and VRML instead of creating another proposal got one of the most voted. The existence of companies that design VRML worlds for companies and institutions. Read the news here. Remember that you have until this Friday July 17, 2009 to send your proposal and show it on SIGGRAPH (New Orleans). "If you have AMAZING, COMPELLING and INNOVATIVE cross platform X3D or VRML content, you may be invited to be a speaker to discuss and demonstrate your products at our Web3D Tech Talk. You will have 10 minutes to present your work and the tools used going from your concept to the final product." Recently, ABNet V3 free Multiuser Server was launched. The new Chat client plugin is based on Flash technology. Although it only works on Internet Explorer, the plans of Rick Kimball is to make it compatible with other browsers and operative systems. And, certainly, Flash is the way to go. - Full UTF8 support: Now VrmlPad allows to view and edit multilanguage characters. - Preview in separate window: To preview a VRML scene or individual nodes VrmlPad provides wrapper window for VRML-viewer clients. The upgrade from v. 1.3 or earlier versions: 99.95 USD (regular price), 49.95 USD (academic price). VRMLPad has lots of features for edition of VRML files, and has been the main editor for many people for ages. Paralell Graphics are the makers of Cortona VRML viewer that works on Firefox and Internet Explorer and office applications (Microsoft PowerPoint, Microsoft Word, etc).